I thought a few Big Muff fans who were looking for something a little different may be interested in this. From the runoffgroove website: "The Whisker Biscuit is a hybrid of the Bazz Fuss and the Big Muff Pi. A single Bazz Fuss stage replaces the two clipping stages of the BMP. Smooth, super-long sustain, and good clean-up with the guitar volume knob make this circuit an interesting alternative to the standard BMP." They suggest that for "a velvet-like reduced treble sound" you can add a 47pf cap (or choose a value to taste) in parallel with the 470k Base/Collector resistors in Q1 and Q3. Like you see in the Big Muff circuit. You can tag this one verified. I did the board per original layout without 47pFs and i omitted the power filter 100µF cap. But. I soldered two wires to left hand side strips two and five. Then soldered other wire to two position 2PDT switch lug 2 and the other wire to 47pF cap's other lead - then other lead of that cap to switch lug 1. Anyway. That works, and gives me "Cream/Harsh" switch. Simply put, that switches between two 47pF caps in circuit or off the circuit..
Then the transistors.. MPSA13 with hFE of 5000 makes this sound more like Devi design than anything else. Also, the tone pot (i'll talk about that soon..) at minimum, gates quite harshly with those stock transistors. Didn't go with BC108/BC109 or 2N2222 this time - Since this isn't supposed to be vintage design - i swapped the 2N5089s with 2N5088s and MPSA13 with 2N5089. These i left in, as i liked them better than original ones. 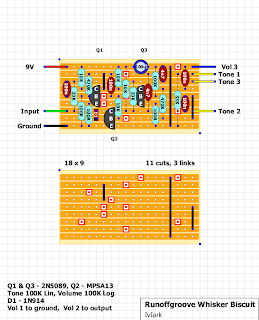 I guess lower gain transistors would give this more cream and less non-ic BMP harshness. After all, it's a bit more distortion like sound than your average fuzz. Then the tone-pot... I don't think that this should be called "tone" at all. Well. It affects the tone, yes. But don't confuse it with tone controls you can find in every design. I would rather call it "Gate/Sing" pot as it gates nicely in ccw and sings like a muff in cw position. More like a distortion than a fuzz. Cream/Harsh switch gives it more versatility. "Tone" should be called "Gate/Sing". Very nice project. Fairly simple and quite easy to build. Sounds really good and can't be compared to any "hit" stompbox around. Nice little circuit. This is a keeper - as it produces BMP-like tones and much more. That switch would have been easier to implement with 4 pole two position, but it's much cheaper to just use 2 poled On/On. Nice work, this looks like a sweet project as I love both the Bazz Fuss and the BMP. I noticed in your description of the switchable caps mod that you mention two wires on the right hand side of strips 3 and 8, but the 47pF cap at the right hand side of the board is connected between strips 4 and 8. So, should that wire on the 3rd strip actually be on the 4th, or have I got myself confused? Also, it'd be nice to be able to drop the switchable caps in and out using a foot switch, what kind of switch would I need/how would I go about wiring it in? It is the fourth. I must have made an error on the original text. Here's my second WB without the 47p switch. I used bigger piece of vero, so i could mount it to the original mounting holes of the enclosure. I was quite puzzled at one time of this build.. Volume pot's lugs were barely touching the enclosure, which made it sound quiet and just plain wrong. Remounted the pots, and .. ahhhh.. This won't be for sale. Ever. Awesome, where did you get the box? From a friend. He switched over to modular synths a couple of years ago and we traded some stuff. 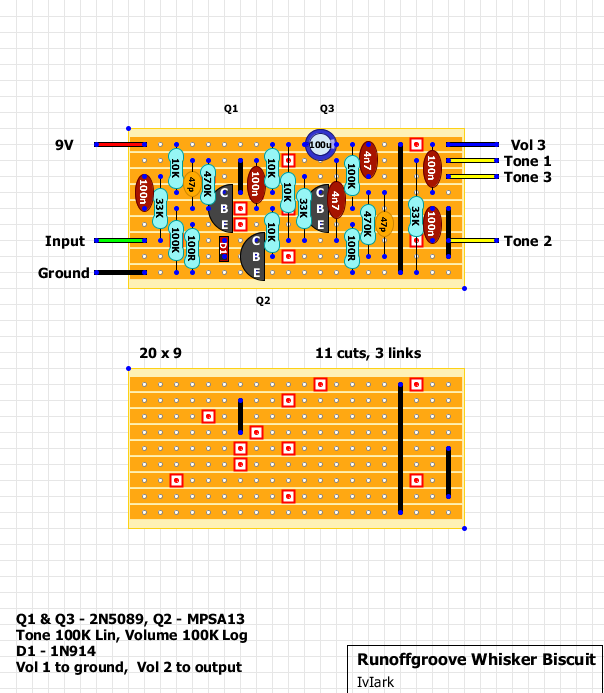 In the process, he got my "Macheen" and Si Fuzzrite clones and i got that enclosure (factory reject without bottom plate and rubber pad), couple PCBs and some other stompbox related materials. He got the enclosure years ago from some australian dude through ebay.. I've been thinking of doing a "smooth/harsh" mod to mine, and thanks for the feedback on this. I ended up putting in an LED instead of the Si diode, and this makes it a great distortion/OD, especially when coupled with way low gain transistors. Doesn't really defang it so much as make it a different beast altogether. Anyone have a suggestion on a Flat/boosted Mids switch like the various BMPs here have? Hello I have built this pedal and apart from sounding good I noticed two things. 1. It is very noisy, at least I find it noisier than the green russian BMP that I also built from the vero layout in this site and 2. It is super loud, it has tons of gain with the volume knob. Could this be something from my build or maybe a general behaviour? I have triple checked everything and I am quite confident that there are no mistakes in my build. No that sounds about right, especially the enormous output this circuit is capable of. it will be great insert a gain pot on that one (it´s possible that?).. and think on use two 1n34 Ge, instead D1. Would connecting a 5k pot right before the ground (between the Emitter's and the ground) allow you to add a gain pot to this? I've added a gain pot to my bazz fuzz that way but I wasn't sure if it would work that way with this circuit. Well... this effect is not that great IMO. I figured it would be a cool Muff variant with the Bazz Fuss sound we all love, but the tone knob doesn't behave like the muff tone and it really doesn't add much to the traditional Bazz Fuss. I'd recommend building the Bazz Fuss Deluxe instead.